Foster Creativity: Before: Gross Gray, After: Glam, GLITTER! Before: Gross Gray, After: Glam, GLITTER! 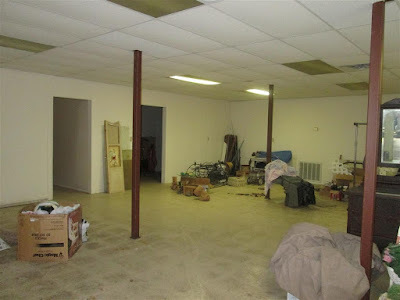 This was our shop before we moved in...just a little on the gross side. I'm pretty sure it was used as a workshop and then just as storage. It definitely needed some work to become a glammed up crafting studio. My husband started cleaning it up. He painted all the walls a fresh clean white, cleaned the floors and painted them gray. Bless his heart, he bought the wrong kind of paint. DIY is not my husband's strong suit. The paint quickly began to scratch and scuff. Taking up the existing linoleum tiles and replacing them with new flooring was not an option at this time due to both time and money constraints. Therefore, I decided to use this as an opportunity to do something fun and creative with the floors. Something involving lots of Glitter! I decided to make stripes on the floor alternating between silver glitter stripes and white stripes. The first step was to spray paint the silver stripes on the floor using silver metallic spray paint. I used the lines on the tile as a guide. I did not do any taping off for this first step. I then let it dry 24 hours. BE SURE TO USE A MASK! THE FUMES WERE STRONG! The next step was to paint on the glitter. I poured an entire container of silver glitter into a gallon of clear floor paint. I did not tape off any lines for this step either. I just stayed in the lines the best I could. Then, I brushed it onto the silver stripes. Be sure to keep it stirred frequently. Allow to dry according to directions on the clear paint. Next, I taped off the stripes on the inside lines of the silver stripes to prepare for painting the white stripes. It was then time to roll on the white paint. I used gloss white garage floor paint. I rolled on 2 thick coats and it seemed to be enough in most places. Three coats probably would have been ideal, but I stopped at two. Then allow to dry according to the directions on the paint. Then you can begin to pull up the tape. I absolutely love the finished product and it is the first thing everyone comments on when they enter the shop! The floors have been done for over a month now and have also proved very durable. I could not be more pleased! If you are looking for a quick, easy, cost effective and glamorous flooring solution, then this is the solution for you!